If you're vegan, vegetarian or just prefer a diet rich in fruits and vegetables, you'll know that there are many plant-based sources of protein. Mushrooms have a very meaty flavor, but this isn't indicative of their protein content. Unfortunately, mushrooms' protein is far less than that of meat products. Mushrooms are one of several vegan-friendly sources of protein. While they're often referred to as vegetables, they're actually fungi. Fungi are similar to plants, but can't survive through photosynthesis. This is why mushrooms are part of their own kingdom (which they share with a few other foods, like yeast). Mushrooms have an earthy, umami flavor allows them to be easily used in place of meats. 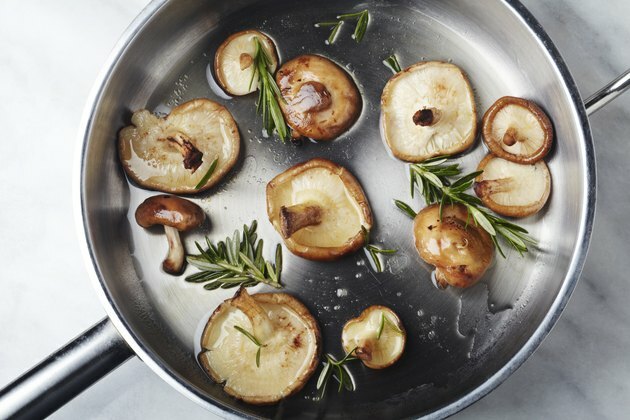 Certain mushrooms also have nutrients that are typically found in meat products, like iron, vitamin B12 and vitamin D.
All of these attributes may lead you to believe that the nutrition of mushrooms is comparable to meat. Unfortunately, even if they have other nutrients, mushroom meat substitutes are a poor choice of protein. Even compared to other, plant-based sources of protein, mushrooms' protein is fairly low. Oyster mushrooms have 7 percent of the (DV) for protein. White button mushrooms have 6 percent of the DV for protein. Morel mushrooms have 6 percent of the DV for protein. Enoki mushrooms have 5 percent of the DV for protein. Portobello mushrooms have 4 percent of the DV for protein. Shiitake mushrooms have 4 percent of the DV for protein. Maitake mushrooms have 4 percent of the DV for protein. Obviously, this is a far less protein than that which you can obtain from meat sources. This means that even duck, the lowest meat-based protein source, has five times more protein that the mushrooms with the most protein. This also means that by weight, the protein in mushrooms is not at all comparable to the protein in meat. According to the Food and Drug Administration, most people need to consume about 50 grams of protein each day. You could obtain all of your DV for protein in less than 200 grams of pork or steak, around 240 grams of chicken and about 270 grams of duck. In contrast, you'd have to eat at least 1,428 grams (a bit over 50 ounces), or as much as 2.5 kilograms (88 ounces), of mushrooms to meet the DV for protein. These amounts are based on the assumption that mushrooms would be your only source of protein. This is fortunately unlikely, as this quantity of mushrooms would be way too many mushrooms. Mushrooms are rich in a variety of vitamins and minerals, which is a positive — but this also means that eating an enormous quantity of mushrooms could cause you to consume excessive amounts of these nutrients. Mushrooms are a great source of many different vitamins, minerals and other nutrients, like antioxidants. While they're widely recognized to be low in fat and a good source of fiber and unsaturated fatty acids, their nutrition can differ greatly. For instance, there's 68 percent of the DV for iron in morel mushrooms and just 2 percent in portobello mushrooms. Despite such variation, mushrooms are reliably good sources of certain nutrients. This includes minerals like copper, phosphorus and zinc. Mushrooms are also good sources of B-complex vitamins like riboflavin (vitamin B2) niacin (vitamin B3) and pantothenic acid (vitamin B5). Combat a wide range of illnesses, including diabetes, Alzheimer's disease and cancer. Fight viruses, bacteria and other microbes, including HIV and malaria. Reduce inflammation and counteract inflammation-related diseases, like arthritis. This means that soybean-based products like tofu and tempeh are comparable protein sources to meats like chicken and duck. One hundred grams of vital wheat gluten has more than your DV for protein and even has more protein than meat products. Vital wheat gluten is easy to cook, has a meaty texture and takes on flavors well. If you're keen on eating richer, meatier plant-based products, you could easily combine mushrooms with vital wheat gluten or soy products to create a plant-based food rich in protein as well as other nutrients. New York Times: What Is the Health and Nutritional Value of Mushrooms?